Adetoyeje Oyeyemi: Recently I was appointed Head of the Department of Medical Rehabilitation (Physiotherapy), University of Maiduguri, Maiduguri- Nigeria. Stephen Brocklebank: As I reflect on graduation 16 years ago as a member of the second class, I want to thank the faculty at USA and my former classmates for their help and inspiration. The experiences and friendships created in those 2 years were an integral in my success as a student and as a physical therapist today. Michael Yuengling: I began a new job with NaviHealth, Inc. as a Post-acute Care Coordinator. NaviHealth, based in Brentwood, TN, partners with Medicare Advantage plans throughout the US to manage members’ post-acute episodes and their experience with transitioning to their next levels of care. Amy McBreen-Babb: My sons, who were babies when I was at USA are both attending college at UF. I am the Chair at a PTA program in Naples, FL and just went through CAPTE accreditation. We got full accreditation and now I know what USA and the first Red class experienced when going through the CAPTE experience. Richard Walsh: This year I passed my final anaesthetic exams. Now to finish my training with a year-long fellowship in regional and vascular anaesthesia. It should be another interesting little adventure! Peter Fischer: I’ve had 2 studies on posture that were published (see “studies” on www.posture-trainer.com) and my latest book will be translated into English for the USmarket (see wirbelsaeulen-fitness.de/german/buchinfo.htm). An English website for the book is in progress. Matthew Shouse: I am Rehabilitation Supervisor at St. Lucie Medical Center, the same facility I started with after graduating from school. I am married to Gina, and have 2 beautiful boys, Kaeden and Caleb, which makes my life one busy, fun, and a happy adventure. Hope all is well my friends. Dave Ghena: I am the VP Operations for Accelerated Physical Therapy and I oversee all the outpatient clinics in MI. I am happily married to my wife of 23 years, have two kids in college, two kids in high school, coach high school basketball and love to be involved in leadership, vision casting and team building. Todd Gooch: Hey Yella class of 2002, want to wish you all a HAPPY NEW YEAR! Miss you all. Those were good times at USA; take a look at the video again, nostalgic right? Humberto Medina: Promoted to an Area Director position for Genesis Rehabilitation Services in Central Florida. Anna Sidd: I am currently working in St. Thomas in the Virgin Islands for a company called Therapy Works. I work in both acute care and at an outpatient clinic. John (Jay) Lamble: I am working as a clinical specialist at an acute care hospital in Evanston, IL. I am a member of the trauma team and I’m involved in research examining the effectiveness of PT intervention with acute care patients. Alisha Jarreau: As of September 2013, I am the new owner/operator of The Therapy Center for Physical Rehabilitation and Wellness in New Roads, LA. I continue to live in Lakeland with my wonderful husband of 9 years and two children, 5 years old and 3 years old. Karyn Reim: I was recently invited to present on gait at the first Fletcher Pilates® Advanced Intensive Course in Tucson, AZ. Fletcher Pilates® is an international educator attracting Fletcher Pilates® teachers and students from around the world. 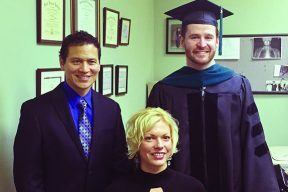 Michael Gentry: I currently work as a full time manual physical therapist and President in three of our private, outpatient facilities in Bedford, Northern Cambria, and Roaring Spring, PA. Mile-Level PT has made the University of St Augustine’s teachings the cornerstone of our practice. We are also a clinical education site for USA. Roshonda Lankford-McWilliams: The knowledge and skills that I attained at USA helped to skyrocket my career. I am the Director of Business Development at Helping Hands Therapy (www.helpinghands-therapy.com). I am proud to announce that with my efforts at Helping Hands Therapy have added several new programs and several new contracts in many settings. Linda Wise: We are enjoying time with our children Katelyn and Brian. Eileen (Becnel) Chisholm: Currently living in New Orleans with my husband, Chris, and daughter, Alli, 2 years old. I was recently promoted to Director of Rehab at River Parishes Hospital in LaPlace, LA. I am managing, as well as working in acute care and outpatient PT and OT. Kevin Lulofs-MacPherson: I am proud to announce that I have taken a Clinical Lecturer position at the University of Florida Department of Physical Therapy. I am looking forward to having a greater impact on our profession by assisting in the education of future practitioners. Leighton Peavler: I am currently employed as a staff physical therapist at Therapy Works, LLC in the U.S. Virgin Islands. The clinic provides PT on an outpatient basis while also serving as a private contractor to Roy L. Schneider Regional Medical Center. Tammi Sheppard: I worked in California, Georgia, and Washington, as a travel PT until finding the perfect job in a hospital-based clinic in Lakewood, WA (Seattle-Tacoma area). I am getting married in May and excited to start this new chapter of life! 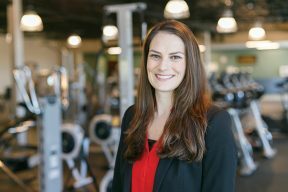 Sara Cates: I am currently practicing outpatient physical therapy and massage therapy at Rehab United Physical Therapy – La Mesa, as well as per diem inpatient work at Scripps Memorial Hospital- La Jolla. I will be undergoing the GIFT fellowship program in 2014 towards higher education in Applied Functional Science, as well as continuing to compete in Ironman distance triathlon. Erica DeStephano: I married my husband, Chris, in May 2011, before moving to Baltimore, Maryland for his residency at Johns Hopkins. I work for Future Care Health and Rehab in a subacute setting. We just welcomed a baby girl named Elliot Carlee in September 2013. Jenna Walters: I’m currently living in Central Illinois. I have a 50/50 split between OT and PT in pediatrics and I will be getting married in April 2014. Life is good! Devin Crebs: I currently work in the Susquehanna Health System at Muncy Valley Hospital in Muncy, PA. I am in the outpatient setting and work with a wide variety of patients, ranging from pediatrics to geriatrics. I also have the opportunity to work in the acute, inpatient and rehab settings on weekends. Julie Johnson: I am currently working in a pediatric neurosurgical hospital in Uganda E. Africa. I am currently working on an NIH study with Boston Children’s and Sick Kids Toronto, looking at Neurocognitive outcomes in children with Hydrocephalus. We are looking to begin a PT bachelors program in Uganda. Gwen Morgan: Since graduation I have worked for a travel therapy company taking me around the country. I have since accepted a permanent position with Carolina Physical Therapy and Sports Medicine in New Bern, NC. This clinic is an outpatient orthopaedic clinic, where I am continuing to work toward accruing hours to be able to test for the CHT exam. Jason Grammer: I am a Physical Therapist in Birmingham, Alabama at Eskride & White Motion Therapy. We are an outpatient orthopaedic clinic that focuses of improving patient’s mobility so that whatever they like to do they can perform better. Lucas Pratt: I currently work in an outpatient orthopedic clinic for Concentra Physical Therapy. I am the Center Coordinator for Clinical Education for seven clinics in Southern California, as well as the ADApt and Ergonomic Evaluation Specialist for the area. I am completing a residency and fellowship in orthopaedic and manual physical therapy through the Manual Therapy Institute. 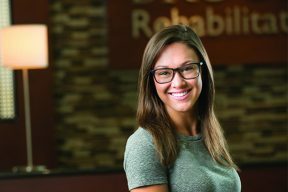 Danielle Sidoti: I am enjoying working full time with Rady Children’s Hospital in outpatient orthopaedics and pediatrics. In fall 2013, I began helping out at San Marcos campus as lab assistant for MS I and loving it! In February, I will become a Certified Educator of Infant Massage to incorporate into my treatment with my pediatric kiddos, while also pursuing my MTC and taking on my first student. Still torn between orthopaedics and pediatrics but loving both! Morgan White: BIG NEWS!! We are expecting our first child! Our baby boy is due to arrive March 25, 2014! So excited. On a professional note, I am currently initiating an early mobilization program here in the SICU at UMMC. It is proving to be beneficial so far. Wish me luck! Marjolein Baas: I still live and work in Citrus County, Florida. I work for the school system, and I also work for an out patient clinic with pediatric clients and high school athletes. Justin Bickford: I work at a Sports Medicine clinic in Manhattan Beach, primarily treating knees, backs and shoulders. I love my job and take pride in being able to place my hands on a patient and take away their pain! Monica Cooney: In August, I accepted a full time position in Opelousas, LA with Moreau Physical Therapy. I helped start the physical therapy department at their Pediatric Therapy clinic and now serve as the full time pediatric physical therapist. Lauren Frauenheim: After graduating from the USA San Marcos Campus in August 2013, with The OC (Orange Class), I moved to NC to pursue an outpatient orthopaedic position. I currently work at Synergy Physical Therapy and Sports Medicine in Jacksonville, NC, and am lucky enough to work alongside a fellow USA alum and FL grad. I look forward to continuing to meet USA alumni, especially during the MTC course in 2014! Brian Mansfield: Employed as a staff PT at Rancho Physical Therapy in Temecula, CA. I will begin their orthopaedic residency program in January. Meagan Singer: Working as a pediatric OT at KIDS Therapy Associates, Inc in San Diego, CA. I provide OT services in the Poway Unified School District and in the outpatient pediatric clinic. Vanessa Stringham: I’ve been blessed to have begun doing pediatric physical therapy with the California Children Services (CCS) program in San Diego and will also be doing a poster presentation at the upcoming CSM conference in Las Vegas this coming February.